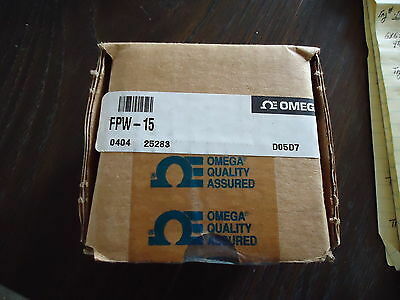 Seller: danddequipment (90) 100%, Location: Kokomo, Indiana, Ships to: Worldwide, Item: 322383277648 tag#492- NEW OMEGA FPW-15, 0404, 25288, D05D7, #863-0412, 120VAC, 120mA, 60 hZ. MADE IN USA. We will ship worldwide, unless otherwise stated. Buyer is responsible for all custom duties and taxes. To overseas buyer's, we do not misrepresent the total sale amount for customs. DISCLAIMER: TERMS & CONDITIONS 1. Buyer hereby acknowledges and confirms that its provision of this WAIVER OF LIABILITY AND INDEMNIFICATION AGREEMENT is a material inducement to D&D EQUIPMENT, hereinafter referred to as "Seller” to sell said materials and equipment to Buyer, that the provision of this agreement is a material part of such sale by Seller to Buyer, and the terms and conditions contained herein shall apply to any and all sales by Seller to Buyer. 2. DISCLAIMER. SELLER HEREBY DISCLAIMS AND BUYER HEREBY WAIVES ANY OBLIGATION, LIABILITY, RIGHT, CLAIM OR DEMAND IN CONTRACT, OR (INCLUDING NEGLIGENCE), STRICT LIABILITY, PATENT INFRINGEMENT OR OTHERWISE WITH RESPECT THERETO. Without limiting the generality of the foregoing, Buyer acknowledges and agrees (i) that Buyer accepts the entire risk and responsibility of taking any necessary action (including performing inspections and undertaking physical modifications) to make the materials and equipment operate satisfactorily and comply with any applicable federal, state, or local laws, ordinances, regulations and standards, including regulations and standards promulgated under federal and state occupational safety, environmental and health laws and (ii)that Buyer shall indemnify and hold Seller and The Third Party Beneficiary harmless from all claims, causes of action, costs and expenses arising out of the purchase and use of the materials and equipment without exception. 3. LIMITATION OF LIABILITY. Seller shall not be liable to Buyer for any incidental, special consequential or exemplary damages based upon, rising out of or caused by the sale, use, or operation maintenance of the materials and equipment by any person whether occasioned by breach of contract, patent infringement or otherwise. 4. SEVERABILITY. In the event that any term of this Agreement shall be found or held to be overly broad or unenforceable, such finding or holding shall not preclude the enforcement of any other term hereof. This Disclaimer has no effect on our Return Policy in ANY way. Powered by eBay Turbo ListerThe free listing tool. List your items fast and easy and manage your active items. Popularity - 329 views, 0.4 views per day, 839 days on eBay. Super high amount of views. 0 sold, 1 available. 329 views, 0.4 views per day, 839 days on eBay. Super high amount of views. 0 sold, 1 available.